22 November 2003. St. Petersburg. RODINA movie theatre (Karavannaya Ulitsa/Str,12) presents the first part of the retrospective SOKUROV. FROM NONEXISTENCE (Nov. 26 till Dec. 1). The movie theatre is planning to show all Sokurov's films in several instalments. See the announcements at www.museikino.spb.ru. 21 November 2003. Torino (Italy). Multiplex Pathe. Retrospective of all films of Alexander Sokurov in the framework of the 21st International Film Festival: ECLIPSE OF CINEMA. ALL FILMS OF ALEXANDER SOKUROV. 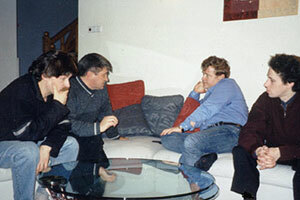 The filmmaker and his team were guests of the festival. 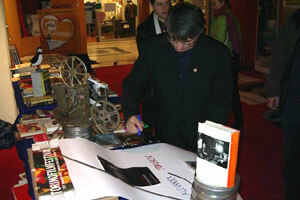 Alexander Sokurov in the foyer of Multiplex Pathe. In conjunction with the retrospective the Italian book ALEXANDER SOKUROV. ECLIPSE OF CINEMA (Aleksandr Sokurov. Eglissi di sinema. Associazione Cinema Giovani  Torino Film Festival, 2003) has come out. This is a collection of the filmmaker's reflections on his creative work as well as memoirs of the members of his team about their collaboration with him. The book is further enriched by the analysis of Sokurov's work by several Italian critics alongside certain international reviews published before. Torino. Meeting with the audience. 07 July 2003. St. Petersburg. Sokurov participates in the radiobridge between St. Petersburg and London (BBC Channel) dedicated to Sergey Eisenstein. during the broadcast from St. Petersburg. 27 June 2003. St. Petersburg. The House of Cinema. FATHER AND SON was shown for the first time in Russia within the framework of International Film Festival of Festivals. 23 June 2003. St. Petersburg. The House of Cinema. RUSSIAN ARK was shown at the opening of International Film Festival of Festivals. 24 May 2003. Cannes (France). Alexander Sokurov receives the Press Award of the International Cinema Festival for the film FATHER AND SON. 23 May 2003. Cannes (France). FATHER AND SON will be shown in the main (competition) program of the 54th International Film Festival. On the same day Alexander Sokurov and performers of the principal roles Andrey Shchetinin and Aleksey Nejmyshev are to meet with the international press. Alexander Sokurov is expected to arrive at Cannes on the day of premiere, if his doctors allow him and if the situation in the producers' group is favourable. 08 May 2003. St. Petersburg. The 11th Film Festival Vivat, Cinema of Russia (Vivat, kino Rossii) has closed in the cinema centre Leningrad. 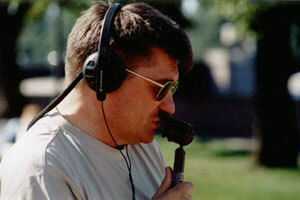 Alexander Sokurov has received the Press Award as Best Director (RUSSIAN ARK). RUSSIAN ARK has won the award as Best Film. 17 February 2003. St. Petersburg. Work on the soundtrack of FATHER AND SON in progress. Discussing the soundtrack with the composer A. Sigle. 09 February 2003. Berlin (Germany). In the framework of the Berlin Cinema Festival in Berlin Rathaus Alexander Sokurov received the Freedom Prize, cofounded by Andrzej Wajda and Philip Morris Company. As the director himself could not be present at the ceremony because of his illness, the prize was given to the Minister of Culture Mikhail Shvydkoi. Earlier this prize was awarded to Kira Muratova, Jan Svankmeyer and Andreas Dresen. In the State Pushkin Museum of Fine Arts Alexander Sokurov was awarded the Russian Independent Prize for the highest achievements in the literature and art TRIUMPH. 19 January 2003. Helsinki (Finland). In the framework of DocPoint Helsinki Festival a retrospective of Alexander Sokurov's films took place. The audience could see 10 movies: MARIA, SOVIET ELEGY, EVENING SACRIFICE, SONATA FOR HITLER, MOLOCH, ORIENTAL ELEGY, HUMBLE LIFE, DOLCE, ELEGY OF A VOYAGE, MOSCOW ELEGY. 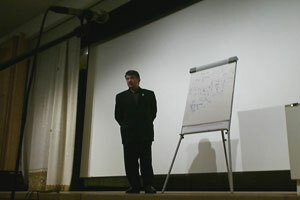 Alexander Sokurov conducts a masterclass in the Russian Centre of Science and Culture. The masterclass of Alexander Sokurov. 16 January 2003. Helsinki (Finland). At the movie theatre BIO REX the Helsinki Documentary Film Festival DocPoint Helsinki opened with the Finnish premiere of RUSSIAN ARK. The crew was represented by Alexander Sokurov, the principal actor Sergei Dreiden, the sound director Sergei Moshkov. 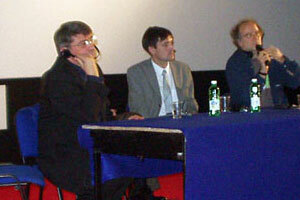 Alexander Sokurov made an introduction before the screening. The guests were greeted by the mayor of the city Mrs. E. R. Siitonen. It was the first screening when the film was proceeded in one piece. 15 January 2003. Munich (Germany). Alexander Sokurov is awarded the Freedom Prize, cofounded by Andrzej Wajda and Philip Morris Company. The award ceremony will take place in Berlin on 9 February 2003. Text of the congratulatory letter from Philip Morris GmbH.